sailboat. : a little bit of luxury. Sometimes spending a little extra on something is totally worth it. Very often there are affordable equivalents of my very favourite things, but there's an almost unexplainable something special about those that offer a little more of a luxury feel. I'm still working on establishing a capsule make up collection, for some reason although I rarely reach for some things I'm unable to part with them, but ultimately I would like to have a small selection of things I really love. And if those things are a little more expensive, I think that's okay. Easily my favourite lip products of all time, I currently have three shades and I'm seriously considering adding another to my collection even though they're quite sheer. They don't look all that different from one another on the lips and although I think that everyone who likes glosses should have one of these in their make up bag, I don't think you need every shade. Unless of course you're like me and want to! I've only had this gloss for a little while, but it's already up there as a favourite. Smooth, not sticky and surprisingly pigmented, it's so easy to wear either on its own or on top of a lipstick. The packaging is equally as lovely as the gloss itself, which for an expensive product is important. A little bit of luxury in my make up bag that brings with it the feel-good-factor. And feeling good is always a good thing. These are my favourite cream blushes of all time. They're lightweight, easy to blend, the colours are lovely and they have a beautiful slightly dewy finish. Gerbera, a neutral peach, is my ultimate favourite shade but honestly they're all so pretty and wearable I wouldn't be able to decide on my next favourite. The single blush packaging is beautiful and although the tin & plastic insert on the palette is a little naff, it's still nice to have a choice of colours in one place. When I first started watching beauty videos all those years ago, this was one of the products that I heard being raved about all the time and I remember thinking that I would never be able to part with over £20 for a bronzer. I resisted for a really long time, but one day I caved and I'm so pleased I did. I've had this same box for a really long time, I've used it almost daily and it looks almost completely untouched. I have to be careful not to apply too much because it's wonderfully pigmented, but it helps to define my face and give a little bit of warmth too. The perfect neutral, douceur is one of those blushes that helps enormously in adding a little more definition to my moon face. It's a little sheer making it almost impossible for me to over-do it in the mornings, which is a big plus for me because I tend to be a little heavy handed. If I were really pushed and could only choose one blush to have, I think it would be this one. It looks quite intense and bright in the pan, but a little of this dusted on the cheeks really does give the prettiest rosy glow. My first really-high-end make up product, it undoubtedly adds more than a little touch of luxury to my collection. The outer packaging is a shiny mirrored silver and it comes in its own little pouch to keep it from getting scratched. A gift from my boyfriend, this will always be extra special I think. Are there any luxury make up products that you really love? The dior blush is so, so stunning I honestly can't get over the colour. 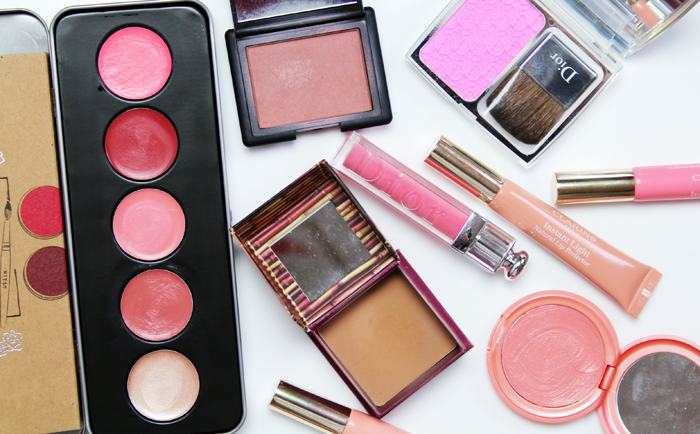 Those creamy blushers sound dreamy! I tend to save my special pricey purchases for clothing/accessories! The Stila palette would def be my pick of the bunch! I love lipgloss so I definitely need to try out the Clarins instant light natural lip perfecter! the dior blush :) you're the one who made me cave and get this hehe. have not regretted it at all! I have douceur and a stila CC palette and love them both, so worth the money. I think a trick to spending less on luxury brands is to find palettes (more bang for your buck) ! Dior make up looks so luxurious, especially that gorgeous blush! I love that Nars blush, so natural! And I really need to get my hands on the Hoola bronzer! I got lip perfecter as a sample about a year back and I'm still using it. Ruddy love the stuff I do. I absolutely adore the Clarins lip glosses - I can totally see what you mean about the shades though, they're so similar that buying more than one shade seems so naughty ha. My favourite luxury products have to be Nars eyeshadows- the texture and pigmentation are just perfect! I love the individual stila blush! Is that the colour Gerbera that you mentioned? 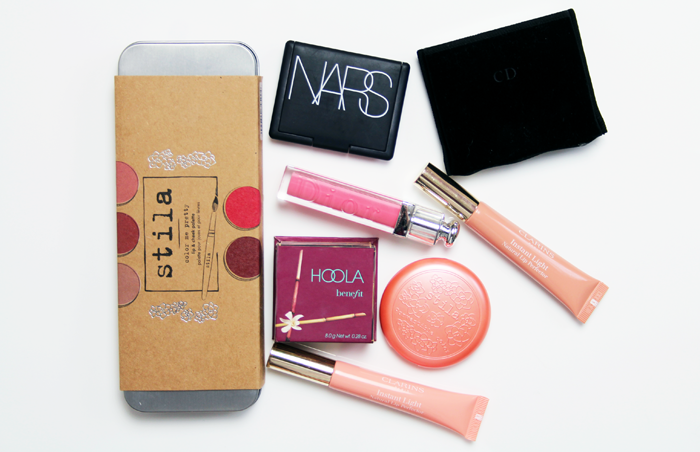 I love the stila blushes. I have quite a few in my collection. It's nice to treat yourself! Even if they are a bit more expensive you just feel good everytime you use them haha. Sometimes there is just no comparison to the luxury items! I think I need that Stila palette in my life! Douceur looks so gorgeous, too. Love this post! I tend to splash out on eyeshadow palettes and blush/bronzers!